After last years disaster on Mount Everest where a massive block of ice calved off above the Khumbu icefall, killing 16 Sherpa, nobody could have predicted an even bigger tragedy the following year. After a 7.9 earthquake destroyed several major cities in Nepal, including Kathmandu, another block of ice broke loose on a saddle near Mt Pumori 3000′ above and behind Everest basecamp. The impact of ice was compared to a bomb explosion spraying rock, ice and snow, killing at least 19 (more unknown) and injuring 120+. Huge aftershocks kicked off additional avalanches in the Khumbu icefall making it too unstable to climb through. This is truly a unique circumstance outside of mountaineering since it was an earthquake outside of the region rather than an isolated incident like the year prior. This is also unique in that basecamp is a relatively safe area, providing a central home away from home for climbers for decades. 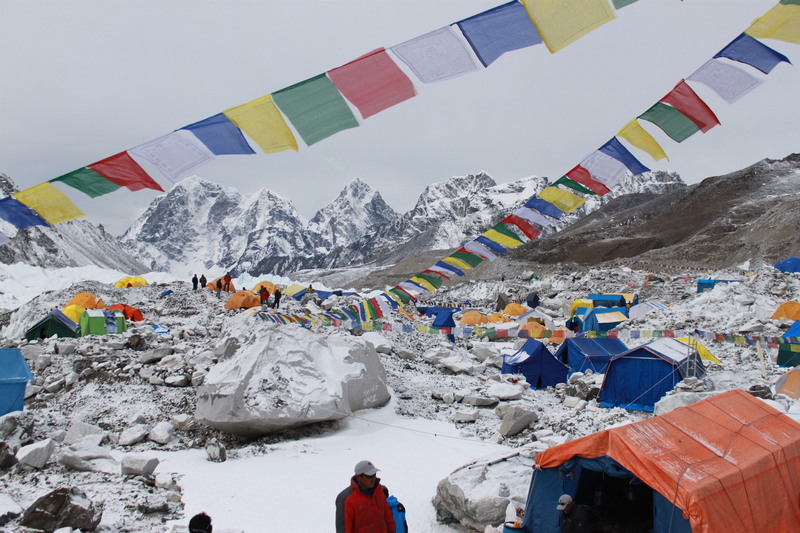 The devastating avalanche didn’t come from the Khumbu icefall but from the opposite side of basecamp. The unfortunate campsites closer to Pumori didn’t stand a chance. This will certainly have an impact on the location and precautions for Everest basecamp in the future, but nobody could have imagined this. When I climbed Everest in 2011 we got dusted from avalanches on Lho La and Nuptse (mountains framing the Khumbu icefall) but never felt at risk of injury while in basecamp. I can’t even begin to imagine what it was like to be there. The next few days everyone at basecamp put their climbing ambitions on hold and took on search and rescue / triage roles. They were able to use some further away camps like IMG and Himex to put the wounded. As soon as the weather cleared helicopters started shuttling wounded down to Pheriche to get better medical attention, but those facilities aren’t equipped for this magnitude of need. They were then picked up on larger helicopters and flown to Kathmandu. The problem is Kathmandu is completely wrecked with 5000+ dead (this number continues to grow). The hospitals are completely full and people requiring attention are waiting for help. It’s a truly horrible scenario. Back on Everest close to 200 climbers were stranded above the icefall, but fortunately in the safest area of the mountain with plenty of supplies (fuel, food, stove, tents) so most of them would agree that they were the lucky ones. After a few days they had a good weather window and the highly skilled Nepalese helicopter pilots were able to shuttle 2 climbers at a time down to basecamp. Only a few remain in the Western CWM at this time. Although the south side of Everest isn’t officially closed it won’t have the support required to get supplies and to fix lines from basecamp to the summit, thus making it very difficult to climb with only a month left before monsoon season. Everest is climbed each April – May, just prior to monsoon season due to more predictable weather windows. A few groups will stick around to see if there’s opportunity to climb, but my guess is they’ll eventually cancel their expeditions. On the north side the Chinese Tibetan Mountaineering Association officially closed Everest climbing due to the potential of future aftershocks. I have friends on both sides of the mountain and from all that I’ve spoken with they are ok with the decisions to not climb this year based on the circumstances. Again this is much bigger than climbing goals being crushed, it’s about a country in shambles after the worst earthquake in 80 years. 1000’s of people dead, lives forever changed, temples (some aging from the 12th century) are gone, villages destroyed or even wiped away in landslides and the list goes on for one of the poorest countries in the world. So what now? From a climbers perspective it’s about taking a step back and gaining some perspective. This doesn’t change the fact that Mount Everest will remain the highest mountain in the world. It doesn’t remove it from any climber’s life long goal to summit it’s majestic peak. It can be tough in the moment after training for years, being financially and emotionally invested, but out of respect for the local people and the state of the country it’s important to press pause on personal goals to allow Nepal to recover. What can you do? It’s easy to see a major tragedy in the news, feel bad for a few moments and then move on. It’s the society we live in. For those of us that have been there it’s close to home. We know how wonderful the people are and how deserving they are to not just get a few sympathy tweets and prayers (please continue praying). Break that cycle and actually do something. However be smart about it, do your research and be cautious about who you send money to since Nepal has a history of having a corrupt government and non-profits will turn up in times of disaster to take money without giving to the cause (this world really disappoints me sometimes). But that shouldn’t discourage you from helping, just be smart about it. A country is in desperate need.